The political internment of Marian Price, is a clear a breach of Article 3 of the European Convention of Human Rights and of Article 5 of the Convention. The Convention protects the individual from being subject to torture, including inhuman and degrading treatment, Article 3 and also the right to liberty and security of the person Article 5. Those in detention are also protected by the United Nations Minimum Rules for the Treatment of Prisoners, by common law doctrines and the rules of natural justice, as developed by domestic courts. The basis of Marian Price's release from prison in 1980, was a Royal Prerogative of Mercy. In the absence of the documents concerned, a decision cannot be made either by the by the British Vice-royal or the Parole Commissioners, regarding the grounds for her detention, especially when she was originally granted bail by the courts. No legal authority can take a decision based on the contents of a document it has not seen or make inference concerning the apparent contents of a document, the prosecutors mislaid or destroyed. In cases such as Marian Price, where secret evidence is being relied upon by the British Vice-royal or supposed anonymous parole commissioners, without any safeguards in place, for the protection from abuse of the political internee, there is in this instance, a clear case of political internment without a fair or transparent trial. 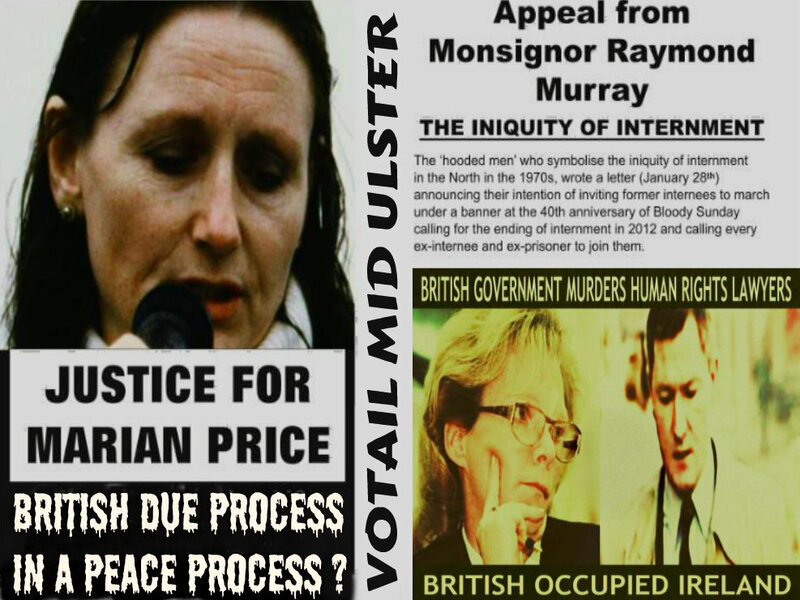 The point of abuse of process, is long past in the instance of Marian Price and the European Courts are the only peaceful route to justice in this matter of British abuse of Human Rights. All Irish citizens and British commoners of the UK, are afforded the protection of the European Convention on Human Rights, as given partial effect in domestic law under the Human Rights Act 1998. This includes the rights of political internees in British Occupied Ireland.